Join us for ‘Silent Launch’ to kick the Fire Starter Festival off in style! Hear from lots of exciting & engaging speakers on the ‘fires of change’ they’ve sparked & be inspired to spark your own! Sign up today! Want to meet the bright sparks that are running some of Scotland’s newest recovery social enterprises? Join Scottish Recovery Consortium for ‘Enterprising Recovery’ and learn more about how we can create different economies and new ways of working and healing. Sign up today. Join us for the Fire Starter Breakfast Club – the creative way to start your day! This is a great informal way to meet other mischief makers and system shakers. Join us at Starbucks, Leith St, Edinburgh – sign up today. Passionate about education? Join the conversation at Edinburgh College, Sighthill for ‘Education for young people – Revolution or Evolution?’ to explore the future role of colleges in giving young people the skills and support they need for the future. Sign up today! Data is the next big thing. Come and find out how National Records Scotland, NHS Information Services Division and the Scottish Government are using data to support public services in Scotland. Sign up today! How can computer models help us tackle wicked problems & improve public services? Join us and explore how modelling can unravel complexity, help decision-making and reveal Surprising and counter-intuitive truths can be revealed! Sign up today! Innovation sounds exciting, but what about simply getting evidence into practice? Join Research for Real for ‘Reigniting Evaluation – When are you ever not prototyping’ and explore how best to create a culture of embedded learning & evaluation. Sign up today! Join ACOSVO for free lunchtime session at the National Library to learn more about Leadership Exchanges – a great chance to learn more about other sectors & reflect on your own leadership. Sign up today! Interested in having better conversations? Want to support your staff & colleagues more? Join the Scottish Coaching Collaborative for a Coaching Approaches workshop at the Scottish Parliament and learn about how you can use coaching skills at work. Join today. 2018 is the Year of Young People. Want to involve young people in the design of your services? Join Young Scot for a session all about Co-design & learn how young people can help shape Scotland for the future. Sign up today! We know that the future is digital. How can we help people to go digital with health and care and ensure they are getting the information they need to live longer healthier lives? Join NHS Inform to explore – sign up today! Does using “impact” or “outcomes” for performance management create worse outcomes and increase costs? ‘Impact Heresy’ will examine and seek to understand what happens when we use “impact” or “outcomes” for performance management. Sign up today! If we want to improve performance in complex systems, how should we fund, commission and performance manage differently? This session will focus on elements such as motivation, letting go of control and creating learning environments – with examples from across Scotland. Sign up today! Join us for the Fire Starter Breakfast Club – the creative way to start your day! This is a great informal way to meet other mischief makers and system shakers. Join us at Starbucks, George Street, Edinburgh – sign up today. How can an understanding of art, creativity and imagination enhance and develop facilitation of change? Can we use art to provoke, unsettle, provide a new perspective? Can we release the social imagination – the capacity to invent visions of what could or should be? Join the Facilitators Network to explore – sign up today! 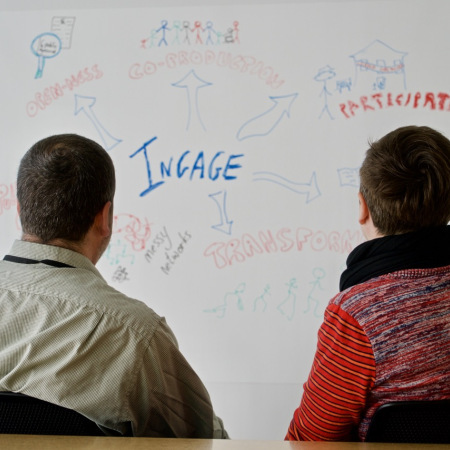 Innovative, creative, enterprising… We all know the meaning of these words – but what do they mean in public and third sector organisations? Could they be applied to how you and your teams lead? How could an enterprising mind-set help you face challenges and seize opportunities? Join the Social Enterprise Academy to explore – sign up today! Older adults have told us that they can feel quite trapped in a world of appointments, tablets and isolating housing and without companionship and valuable relationships, they can feel quite ambivalent about staying alive let alone looking after their health or taking exercise. Could older people may hold the key to creating motivating messages to help encourage or even inspire their peers to Stay Mobile in order to Stay Connected? Join ROAR in Paisley to explore! The Beehive 9.30 – 12.00 – Edinburgh We know that it’s tricky to go to every event during the Fire Starter Festival, so why not join us at the Beehive for cross-pollination! This is a fantastic opportunity to reflect on learning from the Fire Starter Festival and consider how this could lead to new ideas and innovation. Sign up today! What would our towns and cities look like if we put people at the heart of them? We all want communities where everyone, including children, can grow and flourish, with opportunities for outdoor play, safe and active travel, clean air and an environment that inspires, nurtures and frees them. Join us in our pop-up park to imagine what our communities would like if we didn’t use them to store so many cars, and see if we can work out together how we get the Scotland we want – sign up today.